Mount Whitney is the highest summit in the contiguous United States with an elevation of 14,505 feet (4,421 m). It is on the boundary between California's Inyo and Tulare counties, 84.6 miles (136.2 km) west-northwest of the lowest point in North America at Badwater in Death Valley National Park at 282 ft (86 m) below sea level. The west slope of the mountain is in Sequoia National Park and the summit is the south end of the John Muir Trail which runs 211.9 mi (341.0 km) from Happy Isles in Yosemite Valley. The east slope is in the Inyo National Forest in Inyo County. 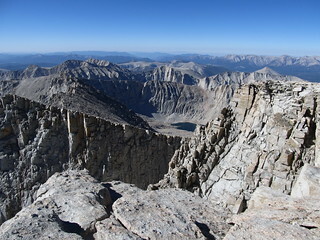 The summit of Whitney is on the Sierra Crest and near many of the highest peaks of the Sierra Nevada. The peak rises 10,778 ft (3,285 m) or just over two miles above the town of Lone Pine 15 miles to the east, in the Owens Valley. Mount Whitney is above the tree line and has an alpine climate and ecology. Very few plants grow near the summit: one example is the Sky Pilot, a cushion plant that grows low to the ground. The only animals are transient, such as the butterfly Parnassius phoebus and the Gray-crowned Rosy Finch. The estimated elevation of the summit of Mount Whitney has changed over the years. The technology of elevation measurement has become more refined and, more importantly, the vertical coordinate system has changed. The peak was commonly said to be at 14,494 ft (4,418 m) and this is the elevation stamped on the USGS brass benchmark disk on the summit. An older plaque on the summit (sheet metal with black lettering on white enamel) reads "elevation 14,496.811 feet" but this was estimated using the older vertical datum (NGVD29) from 1929. Since then the shape of the Earth (the geoid) has been estimated more accurately. Using a new vertical datum established in 1988 (NAVD88) the benchmark is now estimated to be at 14,505 ft (4,421 m). The eastern slope of Whitney is far steeper than its western slope. This is because the entire Sierra Nevada is the result of a fault-block that is analogous to a cellar door: the door is hinged on the west and is slowly rising on the east. The rise is caused by a normal fault system that runs along the eastern base of the Sierra, below Mount Whitney. Thus, the granite that forms Mount Whitney is the same as the granite that forms the Alabama Hills thousands of feet below. The raising of Whitney (and the downdrop of the Owens Valley) is due to the same geological forces that cause the Basin and Range Province: the crust of much of the intermontane west is slowly being stretched. The most popular route to the summit is by way of the Mount Whitney Trail which starts at Whitney Portal, at an elevation of 8,360 ft (2,550 m), 13 mi (21 km) west of the town of Lone Pine. The hike is about 22 mi (35 km) round trip with an elevation gain of over 6,100 ft (1,900 m). Permits are required year round, and to prevent overuse a limited number of permits are issued by the Forest Service between May 1 and November 1. Most hikers do the trip in two days. Those in good physical condition sometimes attempt to reach the summit and return to Whitney Portal in one day, thus requiring only a somewhat easier-to-obtain "day use" permit rather than the overnight permit. This is considered an "extreme" day hike, which normally involves leaving Whitney Portal before sunrise and 12 to 18 hours of strenuous hiking, while struggling with altitude sickness, cold air, and occasionally treacherous surface conditions (because snow and/or ice are normally present on parts of the trail, except for a short period from early July to late September).